The student and Army veteran who witnesses say charged the shooter at a community college in Oregon is alert and awake at the hospital as he recovers. Chris Mintz, 30, was shot seven times during the Thursday rampage, but he says his main concern is about the others who were injured. "I just hope that everyone else is OK," he told ABC News this morning. The man’s actions in the fatal shooting, where 10 people died and seven, including himself, were injured, did not go unnoticed by his peers. "He ran to the library and pulled the alarms and he was telling people to run, grabbing people, telling them, 'You just have to go,'" witness Hannah Miles told ABC News. "He actually ran back towards the building where the shooting was and he ran back into the building and I don't know what happened to him," she said of Mintz. 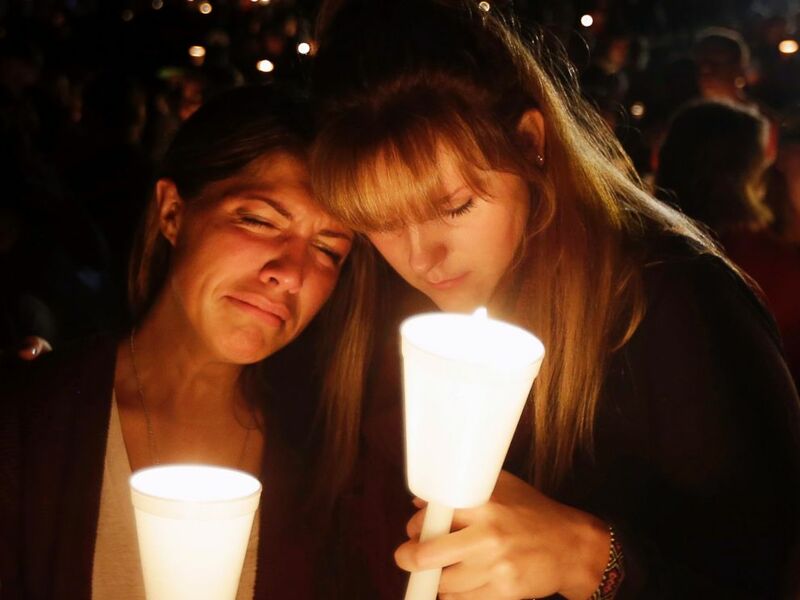 Kristen Sterner, left, and Carrissa Welding, both students at Umpqua Community College, embrace each other during a candlelight vigil for those killed during a shooting at the college, Oct. 1, 2015, in Roseburg, Ore.
Mintz's cousin launched a GoFundMe page to help pay for his ensuing medical bills. "During the shooting both of his legs were broken and he is going to have to go through a ton of physical therapy," Mintz's cousin Derek Bourgeois wrote on the page. "He is a father, a veteran, a student, and now he's a hero," Bourgeois wrote on the GoFundMe page, beneath a picture of Mintz and his son. Mintz is far from the only veteran at the school, with the school's interim president, Rita Cavin, referencing how the military subset of the student body may be particularly affected in the coming days and weeks. ABC News' Michael Del Moro contributed to this report.